Rightfully acknowledged as an icon of rhythm and blues, Etta James could, and did, sing an extraordinarily wide variety of music with equal amounts of heart and soul. 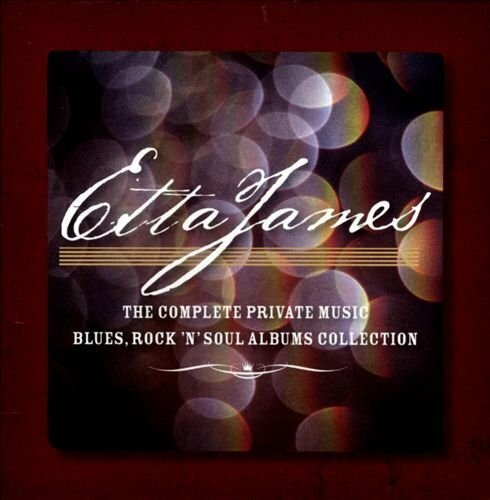 The 7-CD set, Etta James: The Complete Blues, Rock N Soul Private Music Albums Collection, covers 6 of the 12 acclaimed recordings she made for Private Music and RCA between 1997 and 2006. The emphasis in these albums is on the more earthy blues, R&B, rock and occasional country material that this vocal dynamo put her inimitable stamp on. (The more jazz-oriented work that James cut for Private will find its way onto a projected box set in this series.) This set, which includes Love's Been Rough On Me; Life, Love And The Blues; Matriarch Of The Blues; Burnin' Down The House; Let s Roll; Blues To The Bone; and the bonus disc: Live From San Francisco (recorded in 1981) returns five of these prized albums to CD. At the time of her passing in 2012 - after a career that stretched more than a half-century - James was acclaimed as the musical titan she surely was. A Rock And Roll Hall Of Fame member, and a three-time Grammy winner who also received a Grammy Hall Of Fame and Lifetime Achievement Award, James was an inspiration for generations of musicians, as demonstrated by the 2012 Grammy Awards tribute to her featuring Bonnie Raitt and Alicia Keys. Stocked with blues staples, R&B standards, and interpretations of rock tunes from the likes of The Rolling Stones, Bob Dylan, The Eagles and Creedence Clearwater Revival, The Complete Blues, Rock 'N Soul Private Music Albums Collection also includes lives versions of such James's classics as "Tell Mama," "Something s Got A Hold On Me," "I'd Rather Go Blind" and, her signature song and wedding favorite, "At Last."